Okay, we’re kidding! (or is that horsing around?) Anyway, one of our neighbors is having a garage sale, and some Amish that live in this area helped themselves to our fence to tie their horse to while they walked over to the garage sale 😀 We certainly didn’t mind…after all, who would mind having a horse on your property?!! We think they might friends/relatives of some other friends of ours. I didn’t know you converted!!!! Neither did I!! He he ha ha! Hmmm…. I——- Family? 😀 I’m not sure! Oops…perhaps they are! 😀 They must be horse-and-buggy Mennonite? Are you guys realy amish or are you Mennonite? I thought they were the same thing. 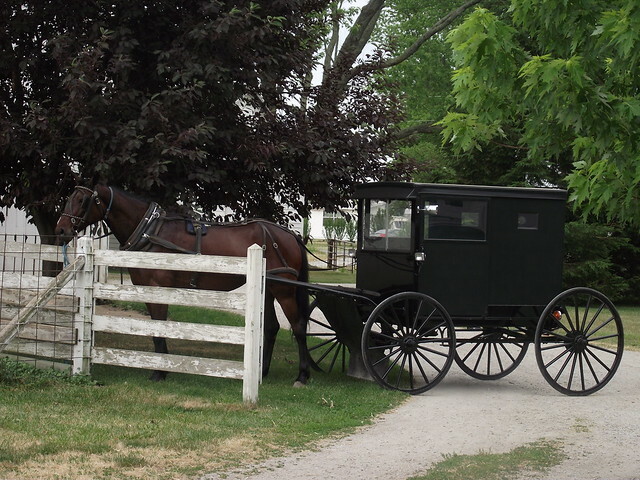 Amish and Mennonite are different from each other…there are a TON of different groups that allow different things, but generally Amish have horse and buggies, and no electricity, while Mennonites will drive cars, have electricity, etc. But that is oversimplifying because there are SO many differences within both of those categories, including Mennonites who drive horse and buggies 😀 Confused yet?! I know I am, lol! Haha! You had me completely fooled for a minute! I don’t read fictional books, so I don’t know the difference. I have to say, I thought they were Amish. I really enjoy your blog…It’s very nice to see other godly young ladies.